In 1500 AD, California was a popular place to live. About one out of every three people living in what would become the United States lived in California. Then, in 1530, the first Spanish explorers under the Holy Roman Emperor Charles V sailed along the California coast. In 1535, Cortes established the city of La Paz in Baja California. Jesuit priests started big farms and ranches all over southern California, forcing local Californian Natives to work for them for very low pay or as slaves. In the 1750s, under Empress Elizabeth, Russian fishing fleets sent out by Catherine the Great began to reach northern California. 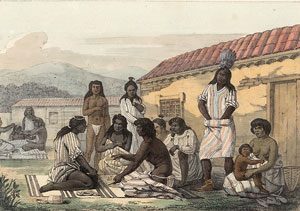 In 1767, the Spanish threw all the Jesuits out of California so the Spanish government could take over their land and wealth. But then Queen Elizabeth of Spain got worried about Russians taking over California. She sent out groups of Franciscan priests to replace the Jesuits. Why did she throw out the Jesuits? California was part of Mexico. Elizabeth and her son, Charles III, also grabbed a lot of Californian land and gave it to rich Spanish people as ranches (farms), where they raised cattle and sheep. They ruled California as part of their colony in Mexico, so California was part of Mexico at that time. Mexico was a big country that ran from Central America up to Colorado and Nevada – and California. Who first started to raise sheep? Both the Franciscan missions and the ranches, like the earlier Jesuit missions, forced thousands of Californian people to work for them as farm laborers for very low pay. Russian fishermen and Spanish priests and ranchers carried European diseases, and in 1802, epidemics of diphtheria and pneumonia killed many Californian people. In the 1830s, after Mexico broke away from Spain, smallpox and malaria epidemics killed many more. In 1848, the United States government took California from Mexico. The US promised to give land to Native people, but they didn’t. Instead, by the next year thousands of new white settlers were coming to California to try to get rich by mining gold. Some came over land, walking or riding horses from the East. Others came by steamboat. In 1850, the United States made California into a state, and more and more white settlers moved to California, either by crossing the Rocky Mountains or by boat, or, after 1869, by train. What are the Rocky Mountains? 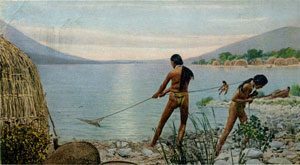 When the white settlers arrived, they took more and more land for their farms from the surviving Native Californians, and from the Spanish ranchers, many of whom lost their land. The new settlers mostly raised wheat instead of cattle or sheep. The settlers killed people who tried to hunt or gather on the land they had taken. What is the history of wheat? By this time the Californian Natives were desperate. In the 1870s, they fought back. 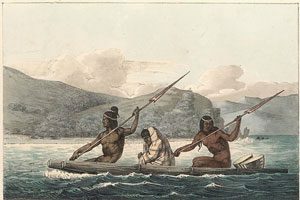 They fought the Modoc War, with their base in the lava beds of northeastern California. But the Natives lost, and the United States army sent some of them to Oregon and some to Oklahoma. Then in 1896 there was another smallpox epidemic. By this time there were very few Native people left in California. Since then, Native people have been increasing their numbers. In 1917, California Natives fought for and won the right to vote. Today many Californian Natives still work on white-owned farms in California. 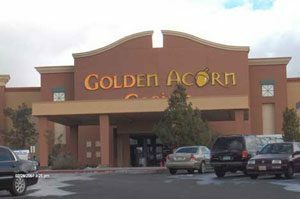 Others have found a new path forward by opening more than sixty gambling casinos. In addition, many Native people have been moving to California from Mexico and Central America, so that today, two hundred years after they lost their land, more than a third of the people in California are Latino. Cite this page: Carr, K.E. Californians fight the Missions. Quatr.us Study Guides, August 12, 2017. Web. April 26, 2019.